Our website has just a taste of our store's offerings, so if you'd like to see more, stop in and visit us in person! 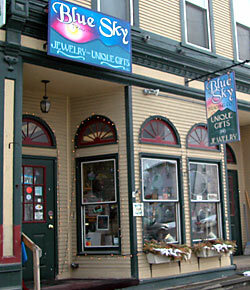 Easy to find in our small town of Ludlow, Vermont, Blue Sky Trading Company is located at 160 Main St. We're right across from "The Mill" at the only traffic light in town. FROM THE SOUTH- Take I-91 North to exit 6, left onto VT rte. 103 North. Stay on 103 N through Chester, VT (route 103 takes a sharp right) and then it’s about 10 miles into Ludlow, VT.
FROM THE NORTHEAST- Take I-91 South to exit 8. Go right onto route 131 West through Cavendish, VT. Then go right onto route 103 North and then it’s about three miles to Ludlow, VT.
FROM THE NORTHWEST- Take route 7 South from Rutland, VT to route 103 South about 20 miles to Ludlow, VT.
FROM THE WEST- From Manchester, VT take route 7 or 7A to route 11 East (about 10 miles) to Londonderry, VT, then go left on route 100 North (about 5 miles) through Weston, VT. Just north of Weston route 100 turns right, make this turn and it’s about 7 more miles on route 100 into Ludlow. Make a right onto Main St.